1. 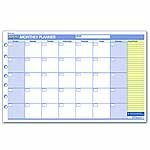 At-A-Glance(R) QuickNotes(R) Monthly Planning Pad, Undated, 11in. x 17in. 2. At-A-Glance QuickNotes To Do Today Planning Pad, 3 3/4in. x 6 3/4in. 3. At-A-Glance(R) QuickNotes(R) To Do Today Planning Pad, 8 1/2in. x 11in.